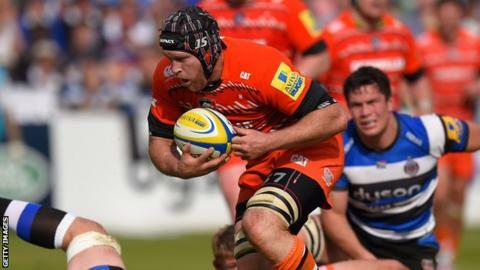 Exeter flanker Julian Salvi says he still has the drive to win titles after his summer move from Leicester. The 29-year-old Australian has won a Super Rugby title with Brumbies as well as the Premiership with the Tigers. "That drive is still there and that passion and that will to win and succeed is always going to be there." he told BBC Sport. "If I can do that here that would be absolutely brilliant and would be one of the highlights of my career." Salvi joins a formidable back-row division at Exeter which includes Thomas Waldrom, last season's Premiership top try-scorer, former England international Tom Johnson and the highly-rated Dave Ewers. He is one of three former Premiership title winners to have joined Exeter this summer, with James Short and Geoff Parling also moving to Devon. "You've got to have that winning mentality, and if a few of us that have been there and done that before and can bring that, it can only be good for the squad," added the Australian 'A' international. Salvi says Exeter's growth from a second-tier team to an established Premiership side drew him to Sandy Park. "It is a team on the rise and wanting to be there or thereabouts in the top four and pushing for championships," he said. "If you look at last season it was 20 points separating them from finishing fourth, and Saracens ended up winning the competition from that fourth place. "In the scheme of things Exeter beat Saracens twice last year. It's a tough competition and you've got to take the points when they come and make sure you're on song every week. "Exeter's a place that will be pushing again this season," he added.